Everything you need for a daily regimen to combat dry, scaly and irritated skin. Kit contains four products, a facial brush and a body brush. Step 1: Uplift Pre-Bathing Oil – The first step to uncovering fresher, healthier skin. Loosens even the thickest, hardest scale from extremely dry skin, in preparation for bathing and exfoliation. Step 2: Clear – Gentle exfoliating cleanser suitable for use on face and body. Step 3: Replenish Butter – The most critical step in the care of extreme dry skin, Replenish Butter replaces needed lipids and provides soothing relief to itchy, irritated skin. 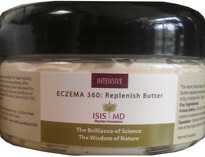 Step 3 in the Eczema 360 daily regimen. Step 4: Protect – Calming, soothing and anti-microbial, this zinc-containing cream is the important final step to protect skin and lock in moisture. UpLift Pre-Bathing Oil – Massage into dry skin, especially in areas with dry, flaky or scaly skin using a circular motion. Follow as directed using water, cleanser and soft brush. Replenish Butter – Apply to entire body as often as needed. For best results, lock in moisture by applying to damp skin immediately after bathing, within three minutes of towel drying. Not intended for use on the face except as directed by your skincare professional. Protect – dab onto skin nightly to soothe and protect.